Lumbar fusion is one of the most common surgical spine procedures. It can effectively treat many low back conditions, including degenerative disc disease, which affects about 30% percent of people over age 30. Spinal fusion surgery is a common treatment for spinal disorders such as spondylolisthesis with instability, scoliosis or severe disc degeneration. Spinal fusion is performed to join (fuse) one or more vertebrae to stabilize the spine and reduce pain. Fusion often involves the use of instrumentation (i.e. screws, rods, interbody devices) and bone graft. 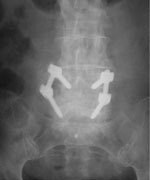 Postoperative x-rays anterior-posterior and lateral views demonstrate good pedicle screw placement and fusion at the patient’s six-month follow-up. The vast majority of lumbar fusions are performed using the anterior-posterior approach, which in our opinion, is unnecessary in most cases. For the anterior-posterior approach, a general surgeon makes a deep abdominal incision and moves the organs around so the spine surgeon can remove the disc(s) from the lumbar region in the spine and replace them with bone graft(s). The spine surgeon then makes an incision in the back to access the spine and introduces instrumentation. The procedure can take up to ten hours and requires an average seven days of hospitalization. This complex reconstructive procedure exposes patients to major surgical access, up to ten hours of surgery, unnecessary blood loss, long hospital stays, considerable postoperative pain, prolonged recovery time and increased complication rates. 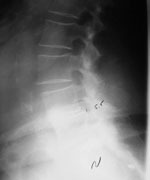 The TLIF technique is a modification of a similar surgical procedure called Posterior Lumbar Interbody Fusion (PLIF). Transforaminal lumbar interbody fusion allows for a more lateral, one-sided approach, with direct access to the intervertebral foraminal area without violating the anatomical integrity of the spine’s neural elements. Performed correctly, TLIF requires less retraction of nerve root(s) and the thecal sac (cauda equina; the tail end of the spinal cord). The procedure also offers the benefit of circumferential fusion and restoration or maintenance of lumbar lordosis (inward spinal curve). While an open anterior-posterior approach can be performed for circumferential fusion, TLIF is less invasive and simultaneously allows for neural decompression and relief of radicular pain. At Boulder Neurosurgical Associates (BNA) we have innovated the way spinal lumbar fusions are performed to reduce associated risks, including postoperative pain and long recovery times and improve effectiveness of the procedure. Boulder Neurosurgical and Spine Associates (BNA) developed a new method to further minimize the invasiveness of spinal fusion procedures. 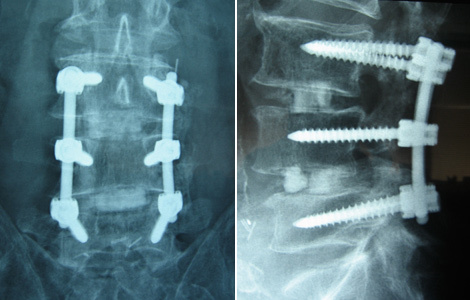 In addition to unilateral pedicle screws, a supplemental interspinous process fixation plate is added, which significantly improves stability of the construct and offers a less invasive alternative to the traditional bilateral pedicle screw fixation. 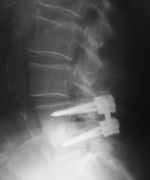 The results of our study demonstrated that this technique was equally effective as traditional bilateral pedicle screw fixation in regards to fusion rates and clinical outcomes. XLIF is a minimally invasive procedure that uses a lateral retroperitoneal approach (from the side through the abdominal wall). The procedure affords the surgeon greater visibility, minimizes soft tissue damage, and reduces patient risk. XLIF is used to treat spondylolisthesis, recurrent disc herniations, foraminal stenosis, degenerative disc disease, degenerative scoliosis, and pseudoarthrosis (i.e. failed fusion). The XLIF procedure provides relief to patients who cannot tolerate a larger, open back surgery because of the increased risks of longer anesthesia time, blood loss, hospitalization, and recovery. It is also a less invasive alternative for patients who have lived with back or leg pain through years of various failed treatments, including steroid injections, physical therapy, and pain medication. The XLIF procedure includes the use of a technologically advanced nerve monitoring system, which allows the surgeon to have accurate, reproducible, real-time feedback about nerve health, location, and function, reducing the incidence of nerve injury during surgery. 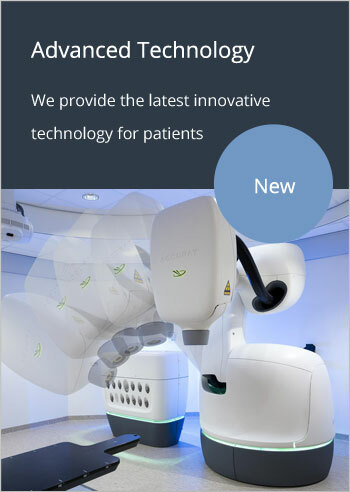 AxialLIF™ is a minimally invasive fusion option that is suitable to treat select spine patients. During an AxiaLIF procedure, the neurosurgeon accesses the L5-S1 area through the sacral spine. This preserves the annulus and ligaments and helps reduce postoperative complications. Autologous iliac crest bone, which involves harvesting a part of the patient’s own iliac crest bone, was previously considered the “gold standard” in spine fusion surgery. This method potentially results in a significant additional morbidity. The autograft harvesting procedure can be associated with increased blood loss, increased operative time, additional complications, prolonged hospital stays and recovery time, along with long-term hip pain and even chronic fractures. BNA surgeons always were at the forefront of this innovative technique and published a landmark paper describing the use of rhBMP-2 in posterior lumbar interbody fusions. This technique virtually eliminates the need for painful bone graft harvesting in 99% of patients and significantly shortens patients’ recovery time. RhBMP-2 (Medtronic Sofamor Danek, Inc.) is a genetically engineered version of a naturally occurring protein that helps to stimulate bone growth. Boulder Neurosurgical & Spine Associates has performed a clinical trial that demonstrated the osteoinductive (ability to cause new bone formation) potential and safety of rhBMP-2 for TLIF in the clinical settings. To determine rhBMP-2 safety, patients that participated in this clinical study were evaluated for possible complications. There were no complications as a result of rhBMP-2 use during the surgery or the two-year postoperative follow-up period. The study also suggested that the use of the bone morphogenetic protein results in a reliable fusion sooner and almost completely eliminates the need for an iliac crest bone harvesting. A solid fusion was achieved in 100% of the patients that participated in this study. X-rays below demonstrate solid fusion. Preoperative antero-posterior and lateral x-rays on the left demonstrate a 5.5 mm instability at L4-L5. 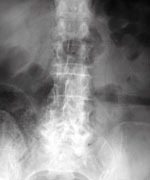 Postoperative x-rays demonstrate good sagittal alignment and fusion.